What happens to a roller coaster once it’s over the hill? It’s July, meaning that summertime attractions everywhere are in full swing. Beaches are beachin’, Dairy Queens are creamin’, and amusement parks are making people scream. But what happens when fall rolls around and amusement parks sit fallow? More importantly, what happens in the amusement off-season, when parks decide what rides to nix and what new attractions to build? To answer that question, The A.V. Club talked to Rob Decker, senior vice president of planning and design for Cedar Fair Entertainment, owner of parks like Cedar Point, Knott’s Berry Farm, and Kings Dominion. A 17-year veteran of Cedar Fair, Decker has worked on a number of projects all across the company’s holdings, including Valravn, a record-breaking dive coaster that hit Cedar Point earlier this spring. The A.V. Club: How does Cedar Fair decide when to introduce a new ride or eliminate an old ride? Rob Decker: It goes in a cadence. We listen to our guests and look at what their tendencies are inside the park. Every now and then, we need something really big to break through the clutter and remind people that we’re a great place and we’re a fun place to go. For Cedar Point, for instance, with Valravn, that’s a big year for us. We put one big major coaster in one of our 11 parks every year, pretty much. Last year was Fury 325 in Charlotte, because we thought that would really induce the market and make a lot of noise, and this year it’s Valravn. Every now and then, it’s got to be something really big. And when we go big, we’re breaking everything, just to get national attention, regional attention, and remind people. Oftentimes, people will say, “What are you putting in? What are you putting in?” And I’ll be talking, but their eyes get kind of glazed over until I say “roller coaster!” And then they tune in. Typically, roller coasters get everyone’s attention and get them excited about coming back to the park. It’s been three years since Gatekeeper. At Cedar Point, every three years, maybe, depending on the economy and how well the park has developed and is performing, we need to keep reinventing, and get innovation percolating, and get people excited about coming back. AVC: With Cedar Point, for instance, you’re on a spit of land and you’re limited by space. How do you decide where to put a new thing, what to get rid of, or what to move around? RD: We are out on a peninsula, and the land and the space is all fully developed, really. If you fly over the top, it’s 364 acres of either parking, attractions, or resorts. What I like to say is that guests tend to vote with their feet. We keep a good sense of how people are using the park, experiencing the park, and what their tendencies are. We get a little bit critical about that, because if there are rides that cost us a lot of maintenance money and the ridership is very low, that’s a pretty easy formula. But other times, we really need to get a big plot of land to get a big attraction in, like a rollercoaster, and sometimes you have to be a bit more critical of what the park’s performance is, or think geographically. If you place all your major attractions in one spot, then that serves as a magnet, but then it tends to make the other parts of the park less attractive to people. So geographically, we tend to spread things out. This year at Cedar Point, for instance, we were dealing with major attractions at the back of the park and the Gatekeeper at the front. So we had to balance the park out. Valravn had to be in the center, so we had to take out a theater, move a couple rides, clear out enough space, and create a new entrance. But that just seemed like the right place to put it to get people to come back toward the core of the park. So that’s how we think about it. Spread the guests out, create anchor attractions not unlike a retail concept or a city core, and then start to move the traffic and attract people to different places throughout the day. AVC: How long does something like that take? Are you planning for 2020 or 2021 now, for instance? RD: We have a five-year plan, so that’s exactly right. Well, we have a five-year capital plan, but for the next three years, it’s pretty serious. Next year, we absolutely know exactly what we’re going to do. For the following year, all the big stuff is settled, and then the third year, we’ve got aspirations for the big stuff. But over five years, it’s the context of this cycle of a big, major attraction, developing our water park side of the business, and then following up with family areas, smaller attractions, or things that kids can do together. You might also look at programs like live entertainment, and do a big blockbuster show one year. AVC: How many of your parks have water parks? RD: They all have water parks now. A lot of times, depending on the market, water parks can drive the business, but you need a hot summer. If you put all your eggs in one basket and you really build up your water park program, and then it rains all summer? We’re a publicly traded company, so we have unit holders and you just can’t have an off year. You need to balance it out. You need maybe four or five of your big parks to perform, despite the weather, despite the economy, despite whatever. You need that. And you need the other let’s say six parks to have enough marketable attractions, either water or hard ride, to draw the people back in. Now, the one thing that we do think about with our water parks is that they build loyalty. You might come to the ride parks several times during the year, but people will buy their season pass for a water park. They think it’s like their summer country club. It’s their place that they can go almost every day that it’s nice out. The kids get to splash in the water, and the parents get to relax, so it’s kind of a glorified municipal pool, or in some ways, their country club. AVC: What do riders want in 2016 that they might not have in 1986 or 1996? How are things changing in the industry? RD: They want bigger and bigger thrills, that’s for sure. People say, “How can you go taller and faster?” and all these things. The limitation is always going to be the human body. We won’t put people through the paces like NASA takes their astronauts through, so we can’t get more aggressive. We have to get more creative. Bigger, taller thrills don’t always mean that it’s a greater force or a less comfortable ride. It’s amazing what’s happening with technology and computer simulations. We can simulate these rides and create interesting aspects and sensations with longer, taller, faster type attractions that aren’t any more aggressive than the ones in ’89. In fact, they seem quite smooth, and that helps us. The other thing that is interesting to us is the digital age is really growing up from under our feet. There’s a generation of people who have grown up with gaming and other forms of entertainment that aren’t necessarily physical or outdoor or active. What we’re trying to do is bring the two together. We’re creating virtual reality or visual fields and experiences while we’re putting people on a rollercoaster, which is really interesting to us, because you still have the physical sensation. If you just close your eyes when you’re on a rollercoaster, you will feel the force of what’s happening to your body on a drop or a bank-turn, or an inversion, or if there’s that coveted airtime where you float up out of your seat. If you can match that up with an Oculus Rift or a Samsung device or something that’s communicating a different experience, you can go anywhere. You can go to Mars, you can go underwater. If we can sync those things up, we can take people anywhere. AVC: You could be on an airplane or you could be in space. RD: A reporter, going back a couple decades, said, “If you could do anything on a rollercoaster, what would it be?” And I said, “I just want to fly.” I wouldn’t want to see that there’s a track, that there’s the restraint, that there’s all the people. I just would feel like I’m flying. And now, with these sensations that we can physically create, we really can fly on these things. You can train your mind to disconnect a little bit and suspend belief, and feel like you are actually doing what we’re showing you that you could do. AVC: Are today’s riders less interested in the slow experiences? For instance, Cedar Point used to have an aquarium, a theater, an African safari, and paddlewheel boats, but those have all been removed. Are people less interested in sitting down and going slow than they used to be? RD: I don’t know about that. That’s another thing that has me curious, because I think that sometimes when a theme park follows a formula, and we worry about capacity and throughput, it’s still a quality experience but it becomes very linear. You queue for the ride, you get on the ride, you experience something great, and you leave. And I wonder, today, if that’s how the world is being regimented, too. You go school, you go to work, you do your thing, you come back. I’m wondering if we did something a bit more non-linear, a bit more adventurous and exploratory, if that wouldn’t have a resurgence? Why not walk through a jungle and explore things around you? Why not climb trees that are really safe to do, in a treetop sort of environment? Or dig in the sand, you know? Why not go back to the basics for kids and young families? That way, parents can sit off to the side and have a cup of coffee and an adult conversation, whereas other times they’re always running to another event, be it soccer, cheer, or something, and the adults don’t even have a chance to catch up. Maybe slow it down a little bit. That might be exactly what we need to do. AVC: How do rides age over time? Is it a ride like Raptor giving the same kind of ride it was when it opened in 1994? RD: The steel coasters are pretty solid. You have to work a lot on the wood coasters to keep them conforming to shape, and you put a lot of money in those over time. But with guests, tastes change, and we spoil them with new attractions and different things. Sometimes we have to come back and switch out things—like at Cedar Point we had this stand-up rollercoaster, and frankly it was just uncomfortable being in a standing position and doing all these loops and everything. So we came back and we made it a floor-less coaster where you sit down and your feet dangle. Sometimes, we have to come back 20 years later and scrap it and start over. We keep the track profile, because it’s a really good track profile, but we make it a new experience. And then we get a second bite at the apple in terms of marketing, because we can put it back out there and say it’s a whole new experience. Same coaster, but new experience. AVC: How often do parks re-fit existing tracks and coasters? RD: Sometimes we make changes. Sometimes we review policies like who can safely ride, or ask if there’s a better way that we can get people with larger waistlines to fit in the rides. It always requires us to be nimble about our business, to keep everyone completely safe. There’s absolutely no compromise there. We just respond to our guests’ needs, and see if we can make a better product for them. If there’s something in our inventory that was built with ’80s and ’90s capital and with just a little bit of an investment, we can make it evergreen or fresh again, then we’re going to do it. We absolutely will. AVC: So bigger people and bigger seats are something that you think about? RD: Yeah, that’s a current thing that everyone’s looking at. It’s something that’s been responsive to the guests. We have to keep them safe, there’s no question there. Something that we just started last year was going back to picking out classic rides from 30 or 40 years ago that have always lasted and aged well and have always been proven over time to just be a really fun, great ride. Some of them are carnival rides or midway rides or smaller, round rides, as we call them, and over time, sometimes they break down and we just get rid of them. But for ones that have been built extremely well, we’re going around the world now and traveling to parks that might be closing, or are just not interested in that ride, and we’re actually taking that ride and completely tearing it apart and rebuilding it and bringing it back and restoring it. There’s this kind of movement like you would see with automobiles, the classic cars are showman-quality, but we’re thinking that we can create classic midways within our parks that start to ring nostalgic with people who have been coming to parks for years. Often times, these things just end up in the scrap heap. But if you just put a little bit of love and care into it and fully restore it, like switching out the engine on a ’57 Chevy and then putting some pearlescent paint on it and really making it sparkle, it could be a new treasure. AVC: Can you give me an example of that? RD: There’s this classic ride, and we’re calling it Flying Eagles. It’s a vehicle that two people sit in, and it hangs by chains, and it just goes around. What happens is, out away from the base, you’re flying but you have full control because you have a fin on the front that you guide, and if you turn the fin, it’s like turning of a tail on an airplane. You will swing down and dive, or you’ll swing back out, so you have total control of your experience. We’d call it interactive today, right? Anyway, it’s a 1920s patent, so it’s an old ride, a classic. We had a couple of them in our parks and people were getting off of that thing and laughing and high-fiving and we thought, “That is such a simple ride.” So we went back to the manufacturer, who’s still in business, and said, “Build five of them for us. Let’s start to fill our parks.” That started a resurgence of their business, so they said, “Hey, we have more patents.” We said, “We’re listening.” It’s just a simple attraction, but it’s always been fun. It does withstand the test of time. It’s appealing to today’s youth in the same way it was for us. AVC: Are there rides you can never close? Where you’d get people chaining themselves to a coaster or something if you were going to tear it down? RD: Yes, it happens sometimes. You have to understand that some rides have fallen in popularity, and we hear it a lot. But sometimes, our rides have very little ridership, and we announce that we’re going to take it out for future expansion, and suddenly everyone loves that ride again. AVC: That’s a metric that you can easily track. RD: Yeah, we know all the statistics. No one ever rides it, but as soon as you’re taking it out, it’s the most popular ride in the park. It’s like taking a couple of songs out of the jukebox that no one ever plays, and now everyone wants them. AVC: How do you deal with that kind of fan outcry? RD: It all depends. If there was a real strong business case to take it out, we make it up to them by building something better. 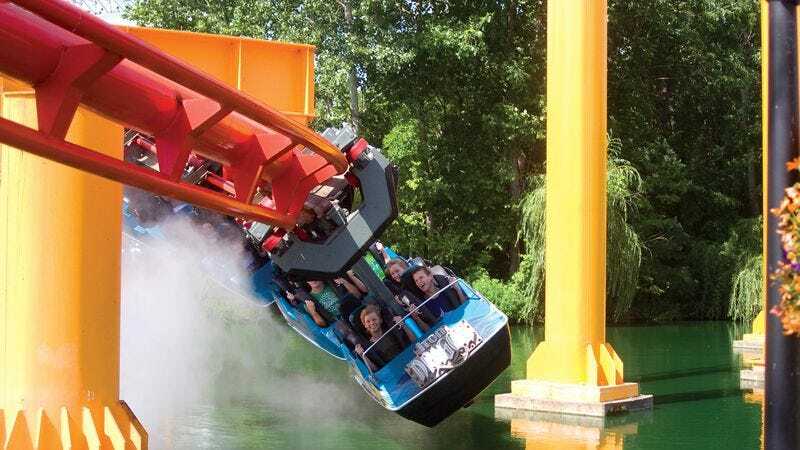 To get Gatekeeper to come into the front of the park, we took out Disaster Transport, which was an indoor bobsled-type ride that wasn’t that popular, and the Space Spiral next to it, which had very few riders, and then we brought in Gatekeeper, which is a really sensational ride. It has somewhat of a different ridership than would go on those two attractions, but sometimes you’re forgiven and sometimes you’re blamed. Still, we have to build new attractions to keep parks fresh, to keep them top-of-mind, and to entertain people. AVC: How do you physically move a coaster? Do you just take it down, piece by piece by piece? RD: Yeah, you do. Same way as you put it up. The parks build all of their rides now. The manufacturers that are in our industry do all of the finite engineering. The shop drawings, which become the fabricated pieces, every part, and then they ship it to us as a kit of parts with instructions on how to build it. We keep all of that information, so we know what the dynamic forces are that would translate into the foundations and the loads and the supports. We know the inventory, and by taking a survey of what the ride is physically in its final built condition, we know exactly where everything should go. To move something, we simply take it off, piece by piece, and put it back together somewhere else. It’s somewhat complicated, but when you get to do that, sometimes you have the opportunity to reinvest in new technology, like new braking systems, new ride restraints within the cars, or new cars entirely. From a mechanics’ standpoint, having a car built in the ’70s upgraded to today’s standards is a real plus, and it helps your maintenance program save costs and have less maintenance needs. AVC: What do you guys think you’re better at than everybody else? RD: We’re always making assessments on how to get better, and really driving innovation. Simply put, we drive innovation by making fun experiences. It has to be fun. We’re always searching for the big idea, and often times it manifests itself in a world-record-breaking something, and that puts us in the innovation and leadership position in the industry. More and more, though, I think we’re thinking more broadly about innovation. It might not be that it’s about the big thrilling roller coaster, but rather that it’s about bringing back some legacy flat rides that people might appreciate, or getting into the digital gaming world. You can’t do it in your mom’s basement, but you can do it in our park at a huge scale. And it’s more social and more communal, and you might be gaming with people you’ve never met. You know their names, you know their tendencies, but you get to meet with them and game together in an environment that’s totally different. It could also be partnering in the amateur sports world and building sports complexes like we’re doing in Sandusky [Ohio] where youth athletics has had such an explosion that there’s so much travel now with softball or lacrosse or baseball, those type of sports. They’re 12 years old and they’re on a team that’s going to compete competitively, and so they get to go to an amusement park as part of that trip. So it’s not just, “Can we build the best ride, make the best experience, and have it be fun?” The broader we get, the wider we cast the net, the more people we can entertain, the more successful we are.